Tennis elbow is an inflammation, soreness, or pain on the outside (lateral) side of the upper arm near the elbow. This injury is due to repeated motions of the wrist or forearm. The injury is typically associated with tennis playing, hence the name “tennis elbow.” However, any activity that involves repetitive twisting of the wrist (like using a screwdriver) can lead to this condition. 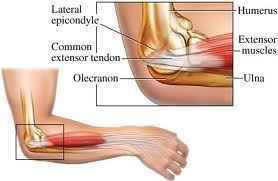 The cause of tennis elbow is Tendinitis (inflammation of a tendon) a very common disorder affecting the elbow. The tendon most commonly affected is the extensor carpi (pronounced CAR-pee) radialis brevis (located on the back of the forearm at the elbow joint). When this tendon or other tendons on the back of the forearm become irritated and inflammed it is referred to as tennis elbow or medically, lateral epicondylitis. A tennis elbow can take months or sometimes years to heal completely if not treated properly. An effective method of treatment has been found to be A.R.T., Graston therapy, adjustments along with cryotherapy. Active Release Technique® (ART®) helps in the treatment of tennis elbow. Rather than just addressing just one area, ART® restores unimpeded motion and function to all soft tissues. Graston therapy is a soft tissue technique aimed at breaking up scar tissue and adhesions to promote the rebuilding of scar tissue in the correct line of force to strengthen the muscle, increase flexibility and movement, and promote normal function of the soft tissue. Graston therapy incorporates the use of stainless steel tools that are used to detect and treat scar tissue within muscles, ligaments, tendons, fascia, and all other forms of soft tissue. By breaking up this poorly formed scar tissue and encouraging the body to form healthier and stronger scar tissue. We will also show you exercises and stretches for you to do. Kinesio tape will also be applied over and around muscles in order to assist and give support or to prevent over contraction, affecting change in deeper layers of fascia by manipulating the skin and muscle and creating space underneath the skin to. Set up a consultation below to discuss how I can help you with your elbow pain. Get the treatment that you deserve at BackAndHealth.